Consultation that was carried out earlier this year has now closed. The outcome of the consultation shows overall support for the scheme. Implementation of the protected cycle lane along West Bank is expected to begin late Summer 2018. The Delegated Powers Report showing the results of the consultation is available to download below. This consultation seeks to gather your views on Hackney Council’s proposals to improve the environment for cycling as part of the Cycle Superhighway Route 1 (CS1) on West Bank between Amhurst Park and Dunsmure Road. The proposals will create a protected cycle track by removing the parking spaces on the eastern side of West Bank. Our Transport Strategy includes a Liveable Neighbourhoods Plan, which recognises that streets like West Bank are not just places to park vehicles or drive, walk and cycle on. They are also the places where we socialise and live our lives. An aspiration is to reclaim Hackney’s streets from parked vehicles and motor traffic congestion and transform them into the most attractive and liveable neighbourhoods in London. alarming rates of asthma and other respiratory illnesses in our schools (GLA, 2008). People have raised concerns with the Council about the volume of vehicular traffic and the difficulty to negotiate this particular road in both directions. West Bank is a busy, narrow road with vehicles parked on both sides and queuing, mostly northbound, during peak hours. People cycling northbound are often tailgated aggressively by drivers trying to pass where there is no space. People cycling southbound have to avoid oncoming vehicles travelling at relatively high speeds for the road and are in danger of being hit. Taking these concerns on board, we are proposing to install a protected cycle track along the whole length of West Bank. A key objective is to create a safer, more pleasant environment for cycling on the CS1 route along West Bank. • less congestion, fewer conflicts between drivers and cyclists and less driver aggression. Please refer to the attached drawing for details. In order to improve cycle facilities for cyclists using the CS1 route a protected cycle track at carriageway level will be implemented. 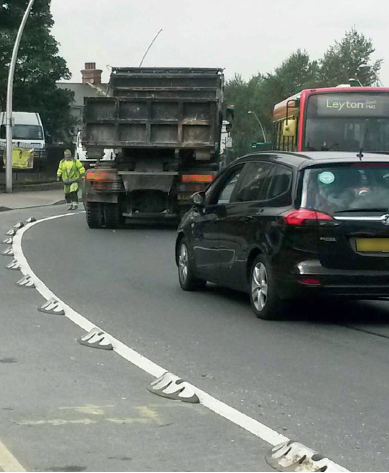 • Road markings and cycle infrastructure such as ‘armadillos’ (see image below) will be installed to protect the cycle track from motor vehicles. • Parking facilities along the eastern side of West Bank will be removed to allow for the new cycle track. Analysis of parking stress surveys indicates that vehicles will be able to use other unrestricted parking spaces in the close vicinity of West Bank. in order to clear the space for the new cycle track and to improve the visual amenity of the nature reserve along the embankment. • Removing the existing kerb extension at West Bank junction with Dunsmure Road. Should the Council agree to proceed with one of these options, a statutory consultation will be carried out and subject to the results residents will receive a letter to inform them about the start date for the scheme. Public notices advising the changes will be displayed in the street.